Speaking about the beginning of a new expansion, Ayala says “right now, the baseline is that we give you three or five packs, we give you a legendary, and we say go.” After that, players not only have to deal with their own daily quests, but often the card packs they’ve purchased themselves as well. That means that there’s plenty on offer, and a good amount of it comes for free from Blizzard, but Ayala points out that “one of the barriers to entry is what to do with all of that stuff that I have.” Being showered in cards is great in terms of having resources at your fingertips, but it doesn’t necessarily make for the easiest onboarding process, which is something Blizzard are attempting to fix. Ayala says that one of the issues is deck-building. “Deck-building is something you have to do before you play a game, but it’s also the part of the card game that people would consider more involved.” He goes on to say that “building a deck is intimidating,” but Blizzard is looking into ways to make it easier. One of those is a new legendary card, introduced in the latest expansion, The Boomsday Project. 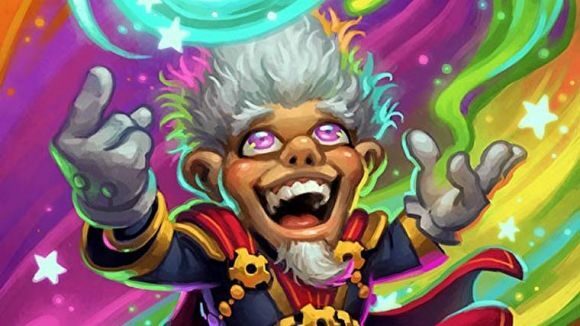 If you have Whizbang the Wonderful in your deck, he’ll replace all of your cards with one of eighteen pre-designed decks of his very own. That’s part of an attempt by Blizzard “to figure out better ways” to let players play as quickly as possible.